Since 1831 Littlethorpe Potteries has produced traditional wares from the famous Littlethorpe clay deposits, which date back to when the Vale of York was glaciated. The Curtis Family welcome you to our web site. You can read up on the fascinating history of Littlethorpe Potteries and the traditional process for making pots, check out our location and maybe call into Littlethorpe Potteries when you next visit the lovely Yorkshire Dales! You'll find dozens of great pots in our catalogue area. If you'd like to buy simply hit the "order" button next to the pot details and when you're ready, submit your order form and we'll contact you for payment. Looking for a unique gift? See our commissioned work section for details of how you can order something truly personalised. Ever fancied your hand at throwing a pot or two? 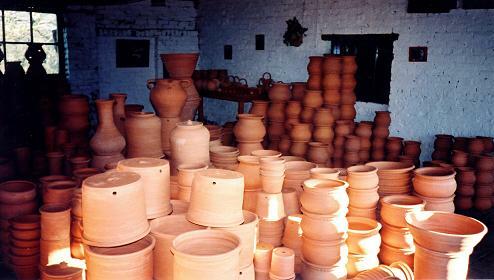 We now run courses to give you the chance to create your own great pots!